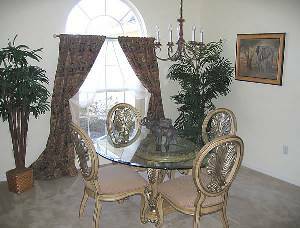 The villa is set in the peaceful countryside of Tuscan Ridge. 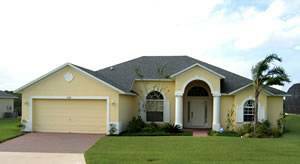 Newly developed and bordered by beautiful citrus groves, Tuscan Ridge offers you the unique opportunity to spend your Florida vacation in a quiet rural setting, yet only a short drive away from theme parks, restaurants, shopping malls and all that Florida has to offer. 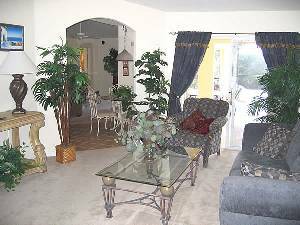 Tuscan Ridge is situated on the US Highway 27, Davenport and offers easy access to the Interstate 4, which is the gateway to all theme parks and attractions. Walt Disney Theme Parks, Universal Studios and Sea World are all to be reached within 20 minutes. Tuscan Ridge has children's play areas and free tennis courts for the use of guests. Restaurants and 24 hour supermarkets as well as specialist shops are all located only 5 minutes away. In the immediate vicinity of Tuscan Ridge are several new championship golf courses, including the one at nearby Champions Gate Resort which has been designed by Greg Norman. The recently constructed, executive style villa has 4 bedrooms, 3 bathrooms and can sleep up to 10 plus cot. It is fully air conditioned and most rooms have ceiling fans. The villa features a fully equipped games room with pool table, roulette and games table and football game. Perfect entertainment for those evenings in. 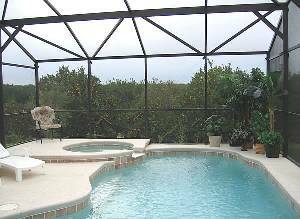 The large heated pool and spa are south facing and overlook picturesque orange groves. The enormous decking area features 2 lanai areas each with ceiling fans, ample sun loungers and a full size dinging table and chairs. Perfect for those who like to barbeque or simply enjoy eating outdoors. A spacious bathroom with shower is located off the pool area. The spacious kitchen with breakfast bar overlooks the family room and is fully equipped with all appliances including dishwasher, fridge freezer with ice maker, coffee machine, blender, toaster, microwave oven and electric hob and oven. 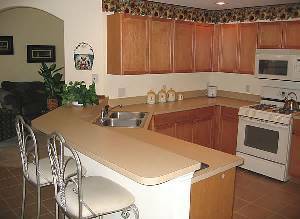 The separate utility room has large washer and tumble dryer along with ironing board and iron. 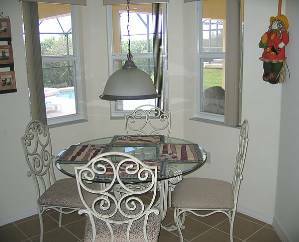 Just off the kitchen is a cozy breakfast nook with views of the pool area. 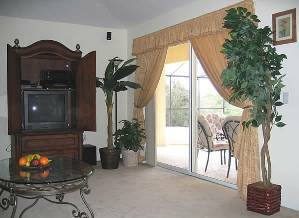 The family room is comfortably furnished and features television with surround sound speakers and VCR and DVD players. The surround sound speaker system includes built in speakers in the master bedroom 2 family rooms and the outdoor pool area. Perfect for relaxing after a hard day at the shopping malls. The lounge has 2 sofas, one of which converts to a double bed. The room is beautifully furnished and has views overlooking the pool area. The villa also has a further three televisions with DVD players. 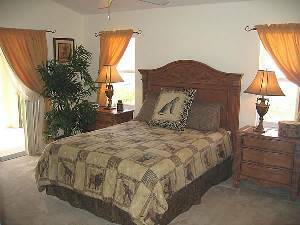 The master bedroom with king size bed, is tastefully decorated and has patio doors to the pool area. A large walk in closet and an enormous ensuite featuring extra large bathtub, double shower and his and hers washbasins are all features of this outstanding room. Overlooking the front of the villa is a formal dining area, tastefully decorated and ideal for those special occasions. Christmas, New Year and Easter	$1750 Per Week.